I agree with everything that you wrote. My apologies if anything that I wrote was confusing. I did not mean to imply that I would not turn on the pitot heat until I was in the conditions requiring it. I would turn it on well before entering those conditions, just as you suggested when you wrote about turning it on before takeoff. For me, flying airplanes which are not certified for flight into known icing conditions, I am simply not willing to fly in a situation that requires pitot heat for an extended period of time. I don't like to fly an approach and landing through such conditions. The chance of ice is small but... I will only launch into such conditions if I know that I can climb out the top VERY quickly. measure even if one intends to avoid all flight in cloud. you wrote about turning it on before takeoff. can climb out the top VERY quickly. I misjudged the "climb out on top VERY quickly" once and scared myself. I have updated the Load Analysis to reduce confusion. I have removed the MAX DRAW columns (required only for the local European Load Analysis). I hope, it's more clear now. The updated analysis will be posted soon in my original post. 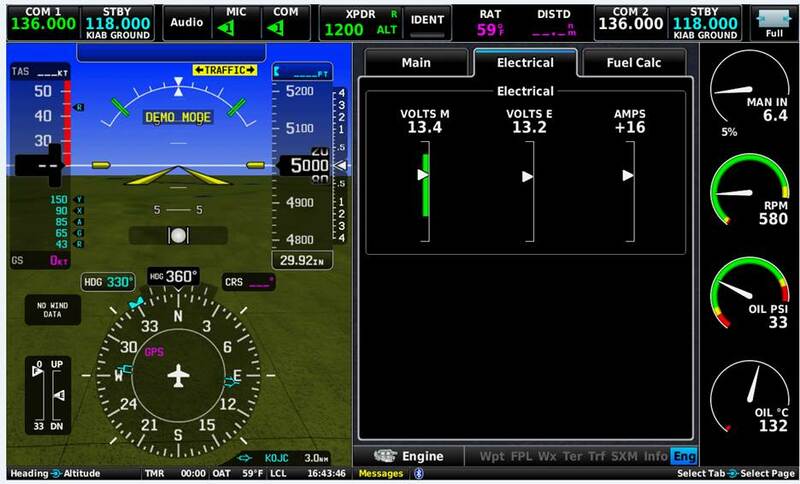 The euipment outlined in the Load Analysis is required for the night IFR flight and will be ON. Let's focus on the el. diagram. I am going to replace the ESS-BUS relay with a continuos duty type relay. Have you found any other hotspots? Is there any G3X Touch expert who can tell me if it's possible to setup the warnings in the G3X Touch for the Voltage as described in my OP? be at minimum after start up, not at max. operating load, not max potential current. somewhere enough to do that. Obviously your regs are stricter than the US. You didn’t send the updated load analysis. As for the G3X touch voltage warnings, I couldn’t find your OP. Which voltages are you monitoring, and where? Respective BUS voltages monitored by G3X Touch. Igor section 18 of the G3X installation manual has all the information for configuring your EIS. While the G3X does support display of 2 different voltage sources, it will combine them on one gauge. This means that your Master Caution alarm and Master Warning alarm thresholds will have to be appropriate to both voltages. I recommend you do not set any Master Warning, and set your Master Caution alarm to ~13.7 V. If either bus falls below this level, you get a warning and can plan accordingly while your battery is still fully charged. My G3X install manual is out of date. It's possible the 2 voltages can be split to 2 different gauges. Check section 18 of your install manual and if possible try it out on an existing installation with 2 voltage inputs. You may be able to set the warnings up as desired. Also the labels available are Main Bus and Aux Bus or Bus 1 and Bus 2. You may want to go with the latter for clarity since an ESS bus is definitely not an AUX bus. > As for the G3X touch voltage warnings, I couldn’t find your OP. Which voltages are you monitoring, and where? Thanks Carlos, I was afraid, the system will not allow labeling the ESS BUS. I have just received a picture from G3X Expert. Apparently it is possible to label the indicators.. Please post the picture and your install manual. Carlos, the picture is uploaded in my previous post.. You can download the current manual directly from the Garmin website. -will I need to have a circuit protection right after the ESS BUS Contactor facing the ESS BUS or is the circuit breaker (ESS BUS 35A) at the ESS BUS sufficient to protect the wire? I guess this wouldn't comply with standards.. Since they can be displayed as separate gauges, you will be able to set up your alarms as you wanted in your OP. > Please post the picture and your install manual. > On Mon, Jan 14, 2019, 15:38 supik AeroElectric-List message posted by: "supik"
> I have just received a picture from G3X Expert. Apparently it is possible to label the indicators..
> -Matt Dralle, List Admin.